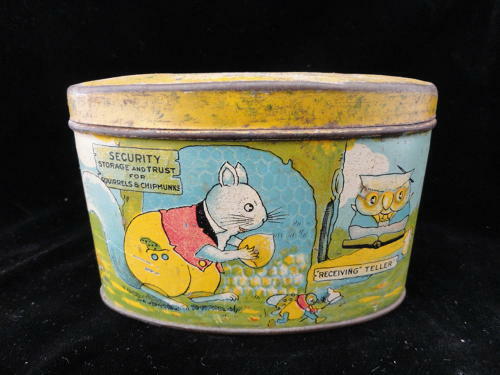 This wonderful antique child's tin savings bank dates to the 1930's. Measuring 4 1/8 " long x 1 3/4 " wide x 3 " tall. Excellent detailed lithographs of a squirrel burying nuts, a chipmunk scurrying, an owl receiving the savings from a squirrel as a turtle goes by. A delightful tin! Condition is very good with vibrant colors, amazing for an 80 year old candy tin.